Looking for an authentic food joint for doctors office catering? Look no further than Chutzpah, an upwardly mobile restaurant that serves soulful meals and treats you like so well you will have no choice but to come back again. With a name like Chutzpah, you wouldn’t expect any less, would you? This food joint located off Route 50 in Fairfax is not your typical New York style restaurant. We love color and you will notice from the bright art and walls that great you when you walk in. We serve hearty meals too – matzo ball, broth, some chicken soup, fresh vegetables, kreplach, noodles, and corned beef sandwich (without Mayonnaise, thank you) among others. We cater events too and recommend that you send in your orders hours before delivery as some meals take over 12 hours to prepare and cook. We prepare orders for groups of 10 and above and could even deliver free depending on your location. All meals are made from fresh ingredients delivered to the restaurant every day to ensure that the final meal is as tasty as should be. We believe in variety too, which is why we have options for meat lovers as well as vegetarians. 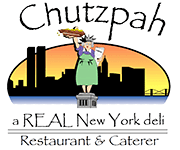 There is something for everyone at Chutzpah Deli. After looking at the main meals, you may want to have a look at the dessert section. We have plenty of baked goodies that we are sure you will love. The beverages are equally great. Want a hearty meal for a gathering but have no time to pop into the restaurant? Just place an order by 3PM prior to the delivery day and we will cater to your guests. We recommend that you place your order that much earlier to give us enough time to prepare the best dish you have had in a long time. Delivery fee will depend on your location, seven days of the week. We have various payment options including personal and corporate checks, cash, most credit cards, and corporate accounts. We also have a flexible cancellation plan where we only charge 25% of the meal’s value if you cancelled an order after 3PM of the day before delivery. Cancellations before that hour will be free. The quality of our food is as good as our customer service. Our friendly staff will not only serve you who a smile, but they will also recommend the best options if you haven’t eaten here before. Even better than our friendly service are our prices. You won’t believe until you place an order – how little you’ll pay for a 12-people platter. Whether you prefer to sit down and enjoy your meal or take it away, we got you covered. We will also deliver authentic meals to your doorstep for any event. So, next time you wonder what to do for a doctor’s office catering, do not hesitate to call us. Hands down amazing. I felt like I was back home. Delicious and our server (so sorry I didn’t get her name) was incredibly friendly and kind! Great Jewish Deli in Fairfax! Great latkes and sandwiches. Nice to be able to get authentic NY deli food here in Va! Have Questions About Doctors Office Catering?